This is my quilt which I have named it ‘Haworth Parsonage’ after the Bronte’s former home. 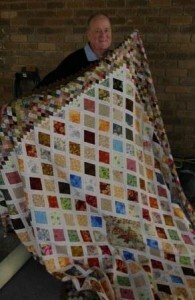 My quilt was inspired by the quilt which is now gathering so much attention. I added another border at the edge to reflect the complexity of the dresden plate centrepiece. Posted in General	| Comments Off on Reworking the Bronte Quilt. In the collection of Haworth Parsonage, West Yorkshire. The group of Totley quilters lovingly recreating the Bronte’s Quilt. 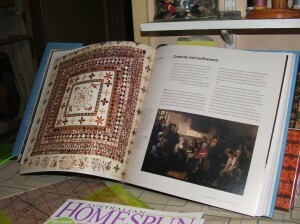 At this point in time I am undertaking study at Latrobe in Bendigo and there is not much patchwork or quilting, research or sewing, going on at present. Just a few more weeks and the end of semester will come around and hopefully this will change. The Jane Austen pattern book and kit are still available as is the cross stitch pattern. We are working on producing a pattern for a reproduction of a quilt that has been attributed to the Bronte sisters that I completed a couple of years ago. Hopefully that will also go up onto the store before the year is out. Stay posted. One of the things about quiltmaking that enriches my life, is the wonderful people who cross your path. A couple of months ago when we had the ‘Jane Austen Quilt Pattern’ ready for sale I contacted everyone who had made an enquiry in the past. Among the replies came an email from a man, I mistakenly presumed the order for the pattern was for a female member of his family. 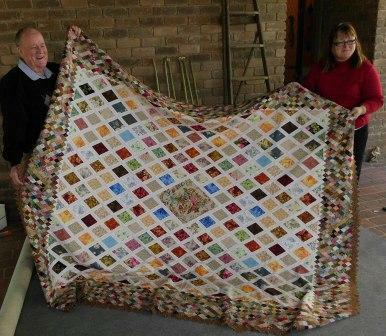 Just one email later and I knew that here was a ‘man’ who wanted to make a Jane Austen Quilt, more astonishing to me was when this gentleman revealed he was nearing 80 years old. We have had a few phone conversations during the making of Ron’s Replica of Jane’s Quilt, Ron seemed to be a gentle spirit who my husband and I both enjoyed chatting to and last weekend when Ron had to travel to Bendigo (Ron is from Wangaratta) for a special family celebration of his 80th birthday, we were blessed with a visit from him and his friend Jean. Straight away both Peter and I knew we had met an exceptional man. Ron hates to waste a minute of his time. He makes every minute count. Ron is the first to finish his quilt top from those who have bought a pattern. This is Ron and his replica which is as exceptional as he is. My husband took a picture of the back of Ron’s little diamonds, such perfection! 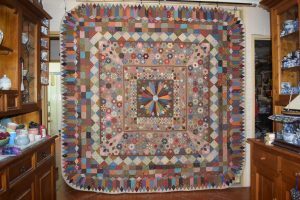 Ron is a prolific quilt maker, with a love of machine embroidery which he incorporates into many of his quilts, he also crochets, candlewicks, and stitches tapestrys. His current total for crocheted knee rugs stands at 150! Posted in General	| Comments Off on Introducing Ron…..
My husband Peter had this great idea that we should make a ‘mini Jane Austen Quilt’ for anyone who has already bought the pattern kit for the full size replica, or anyone who might like to try this first. The centre panel is a replica of the original that was printed by ‘Makeower UK’ in the early 1990’s. Sorry to say I don’t have any to sell, the panel we used was generously given to me. 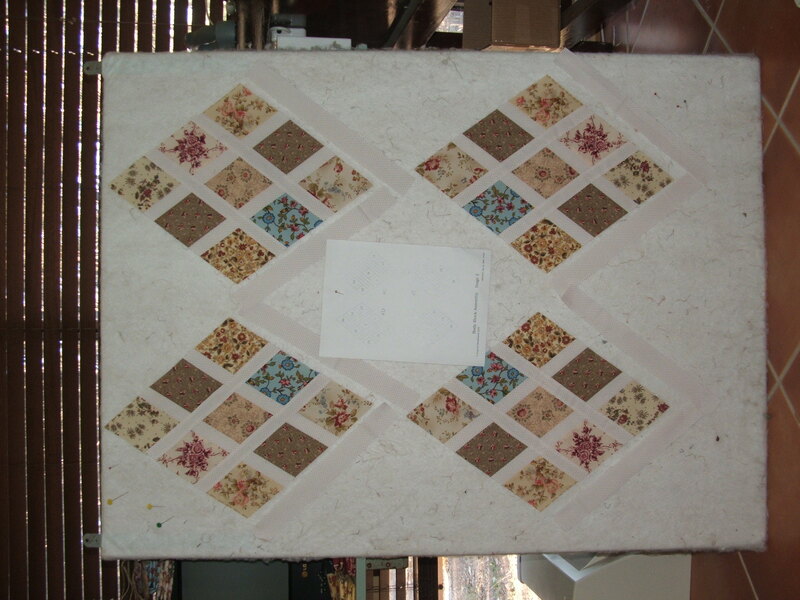 It works perfectly in this mini quilt, as it was reproduced at two thirds the size of the original panel, this was a great opportunity to use it. Pattern for this mini quilt will be available soon. We are very pleased to announce that after many drafts and re -writes and the making of -would you believe? 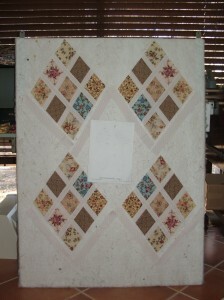 ‘A second Replica’ that we can now offer the ‘Jane Austen Quilt Pattern’ for sale. 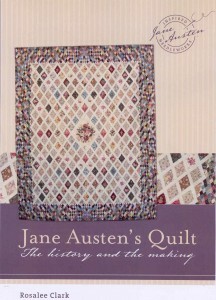 The ‘Pattern’ includes a detailed 120 page book which will enable you to bring a Jane Austen Quilt of your own to life. The $85.00 AUD plus postage price also covers the set of three perspex rulers and a disc of nearly 500 photo images to guide you through the making , ensuring you will end up with a well pieced replica you can be proud of. But what about all those diamonds? I hear you say? The ‘Pattern has been developed in such a way that the cutting out of diamonds is unnecessary. 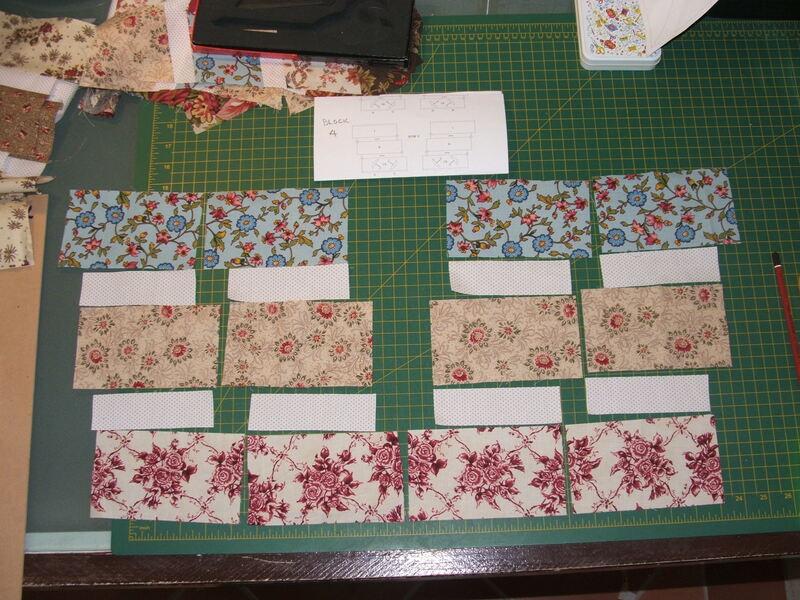 All pieces in the quilt first begin as simple rectangles. The ‘pattern’ is now available from the ‘Store’ page of this website. If you do not wish to use paypal please email me at rosalee@RosaleeClark.com.au to make other arrangements. Posted in General	| Comments Off on Jane Austen Quilt Pattern. Jane Austen’s Sampler & a family connection. 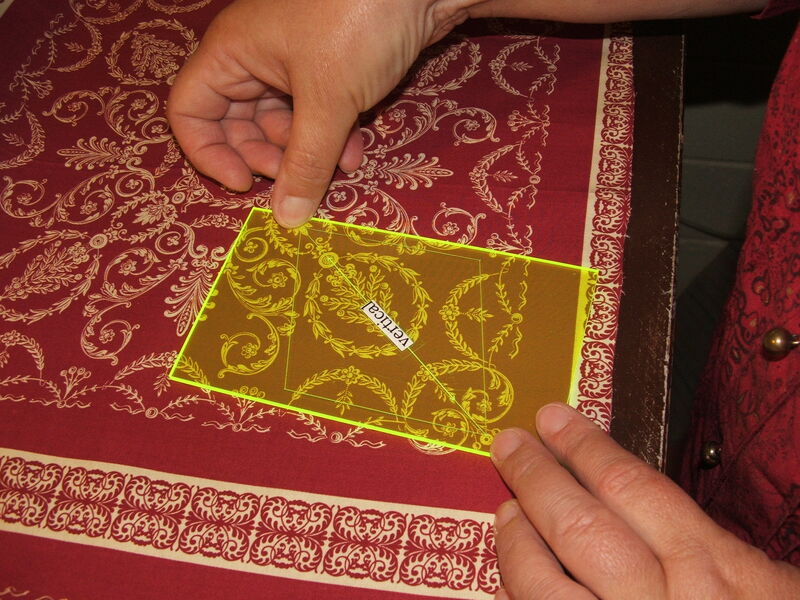 Did you know Jane Austen stitched a sampler? 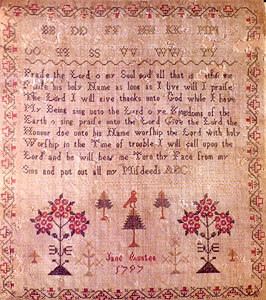 The sampler is clearly dated 1797, although, I have recently read that it it is believed, in some quarters ,that the real date was 1787 which would have made Jane 12 when she stitched it. Several years ago one of my cousins Helen, travelled to Europe. Whilst there on a working holiday she went to Jane Austen Museum in Bath and bought an image of Jane Austen’s Sampler. She then purchased a piece of linen and threads and set about recreating Jane’s sampler for herself. 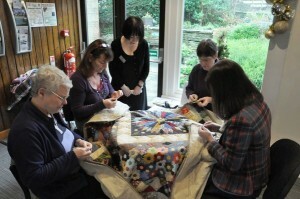 About a year ago Helen came and showed me her beautiful cross stitch and admired my quilt. Neither of us knew we had a Jane Austen connection. Helen had earlier found my website about my quilt replica, and didn’t realise it was me. She wondered about this woman who had the same name as one of her cousins! Eventually after finding a reference on my website to my grandson, she rang me up to see if it was me! It is a mighty small world , is it not. Here is Helen’s reproduction. She has done a beautiful job. Jane Austen Museum in Bath, is Pictured below. 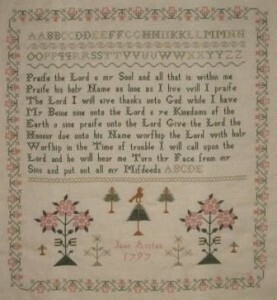 A pattern for this Sampler is available from the ‘store’ on this website. Posted in General	| Comments Off on Jane Austen’s Sampler & a family connection. Louisa May Alcott ‘Ode to Louisa’. 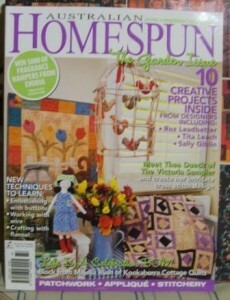 Australia’s Homespun Magazine, has included one of my quilts in its current issue ,Vol. 11 No 8. 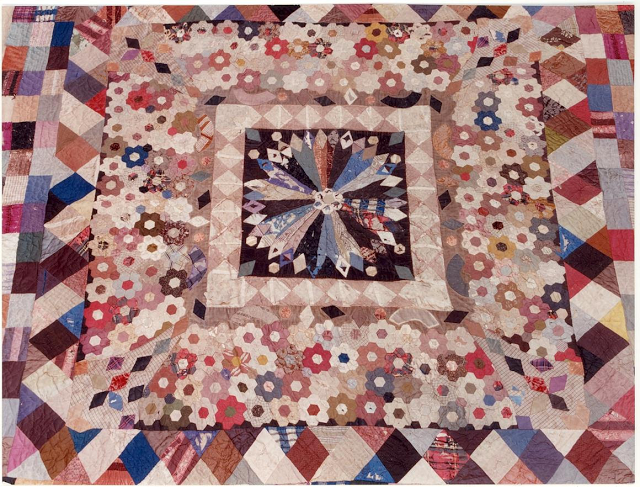 My quilt ‘Ode to Louisa – & The Little Women of Orchard House’was inspired by the story of ‘Little Women’ . The floral centre represents Mammie, and the four corners the Girls, Jo, Beth Meg and Amy. 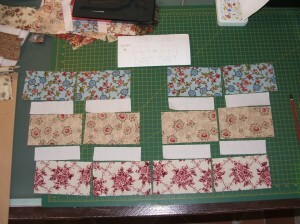 The little squares is called the ‘Dress Scraps’ border. 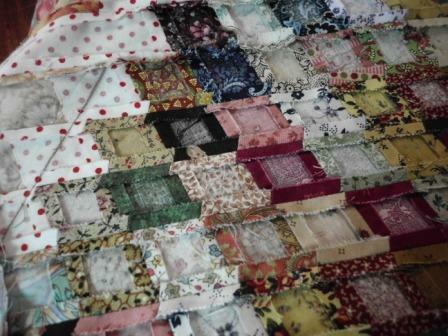 I have used a lot of Jo Mortons Fabrics. which represent well the fabrics of the American Civil War era in which the novel was based. Louisa’s writings in this book remind us all how although we as our family/siblings might all grow up in the same house, we grow as individuals. This reminds us all to treasure our individuality. Here is the quilt in the full. 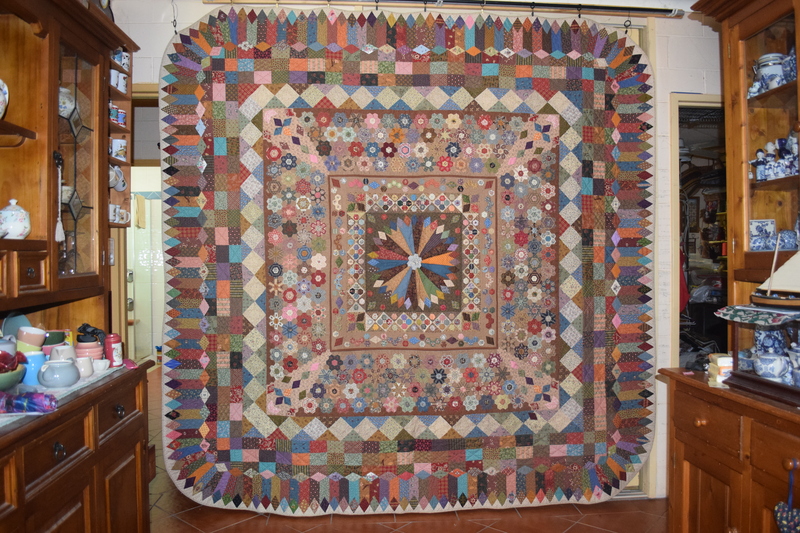 It was machine quilted by Alison Bacon of Canterbury Quilt., she did a wonderful job. 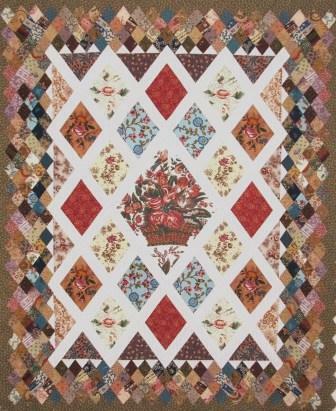 I usually have my sister Maree St. Clair to quilt my quilts, but I had her stressed to the max quilting ‘Chawton’ for me. Chawton is pictured below. It is hand pieced from hexagons, diamonds and half hexagons. Posted in General	| Comments Off on Louisa May Alcott ‘Ode to Louisa’. 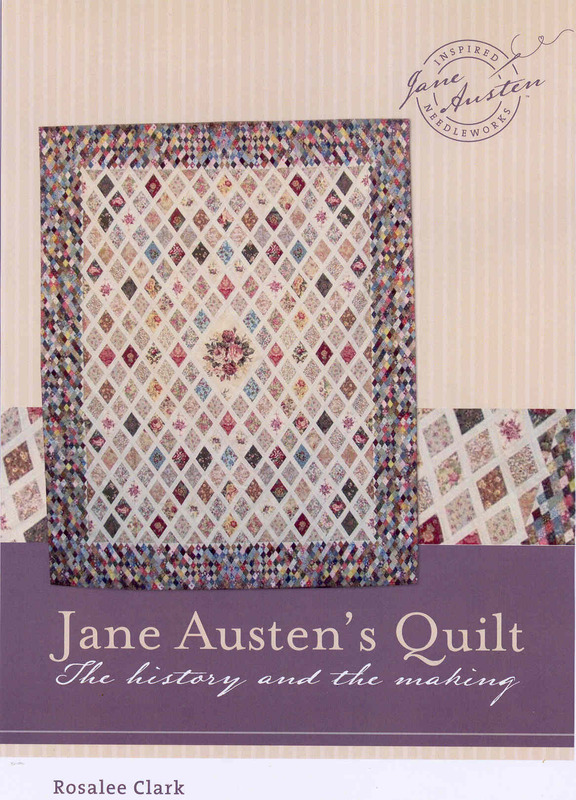 Jane Austen’s Coverlet & The Welsh Quilt Connection. 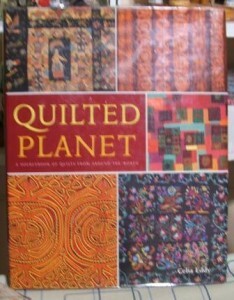 When I Purchased two years ago a book called ‘Quilted Planet by Celia Eddy’ imagine my stunned delight as a came across a Quilt on page 86 . 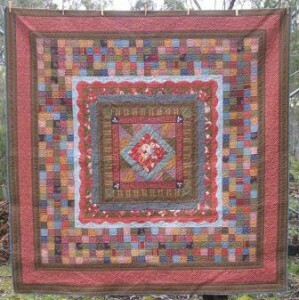 This quilt is a one of Jen Jones Welsh Quilts Collection. Because I have studied closely Jane Austen’s quilt over many years albeit only in photographs, I instantly identified that central fabric as one of the ones the Austens had used in the Coverlet! 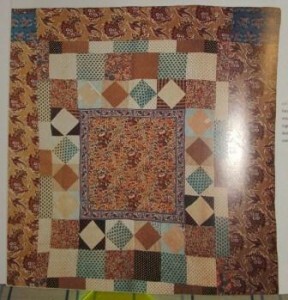 The Welsh quilt is dated as 1840’s I can presume this was ascertained by the youngest known fabric in the quilt. The Austen’s quilt however is dated in the second decade of the 1800’s, so whoever made the Welsh quilt must have kept the piece of fabric for some years before using it. Twenty – thirty years is no time to keep fabric, I myself have some in my ‘stash’ older than thirty years. This must have been a treasured piece of cloth. The Austen’s only had enough to put six pieces in their top and one of those had to be pieced to be big enough for the diamond. Posted in General	| Comments Off on Jane Austen’s Coverlet & The Welsh Quilt Connection. V & A Quilt Exhibition. Hidden Treasures, Untold Stories. 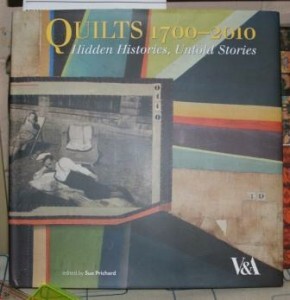 The 4th of August brought the close of the V & A quilts 1700-2010. How lovely it would have been to be able to attend. If I lived in the UK I’m sure I would have been several times. But, for those of us across the sea,I had to make do with what was available on the internet. Until I secured a copy of the Book of the exhibition, collated by Sue Pritchard. What I sheer delight it is! The text and the ‘untold stories’ are wonderful, to read and indulge in. The photography however exceeds all expections it is exceptional! it is a fine substitute for not being able to attend. If you, like myself have a love of immersing yourself in history, and historical quilts, you are going to adore this book. Australias own ‘Rajah Quilt’ was requested to attend this exhibition, and kindly lent by our National Gallery in Canberra. It was no 5, in the exhibtion and features in the above mentioned book. I have never seen such wonderful close up photos of it as in this book. 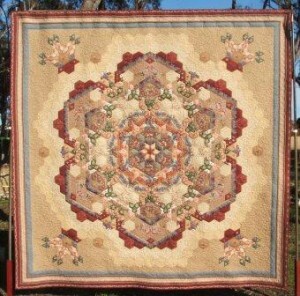 The Rahaj Quilt was made in 1841 aboard the convict transport ship on it way to Van Diemans Land (Tasmania) . 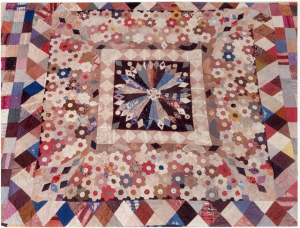 The quilt was made in the thanks to Elizabeth Fry and the ladies of the convict ship Committee. It is only brought out for display a few times a year in Canberra. 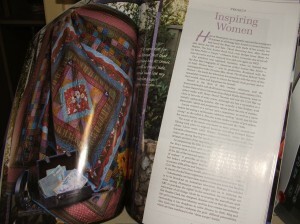 Quilt 1700-2010 book, apart from quilts has many beautiful images and photos, as you can see by the one in the book beside the Rajah Quilt, it is a stunning publication. Posted in General	| Comments Off on V & A Quilt Exhibition. Hidden Treasures, Untold Stories.